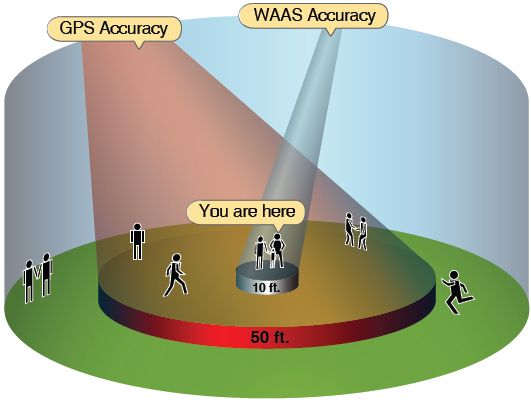 The WAAS is designed to improve the accuracy, integrity, and availability of GPS signals. WAAS allows GPS to be used as the aviation navigation system from takeoff through Category I precision approaches. ICAO has defined Standards for satellite-based augmentation systems (SBAS), and Japan and Europe are building similar systems that are planned to be interoperable with WAAS: EGNOS, the European Geostationary Navigation Overlay System, and MSAS, the Japanese Multifunctional Transport Satellite (MTSAT) Satellite-based Augmentation System. The result will be a worldwide seamless navigation capability similar to GPS but with greater accuracy, availability, and integrity. 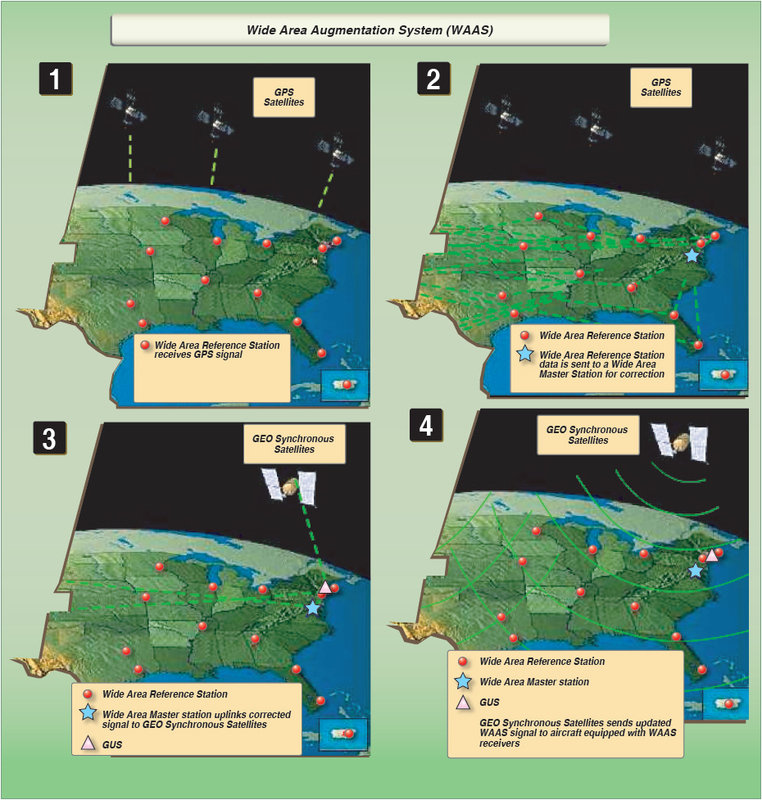 In addition to providing the correction signal, WAAS provides an additional measurement to the aircraft receiver, improving the availability of GPS by providing, in effect, an additional GPS satellite in view. The integrity of GPS is improved through real-time monitoring, and the accuracy is improved by providing differential corrections to reduce errors. [Figure 9-30] As a result, performance improvement is sufficient to enable approach procedures with GPS/WAAS glidepaths. At this time the FAA has completed installation of 25 wide area ground reference systems, two master stations, and four ground uplink stations. Figure 9-30. WAAS provides performance enhancement for GPS approach procedures through real-time monitoring. WAAS avionics must be certified in accordance with TSO-C145A, Airborne Navigation Sensors Using the GPS Augmented by the WAAS; or TSO-146A for stand-alone systems. GPS/WAAS operation must be conducted in accordance with the FAA-approved aircraft flight manual (AFM) and flight manual supplements. Flight manual supplements must state the level of approach procedure that the receiver supports. WAAS receivers support all basic GPS approach functions and provide additional capabilities with the key benefit to generate an electronic glidepath, independent of ground equipment or barometric aiding. This eliminates several problems, such as cold temperature effects, incorrect altimeter setting, or lack of a local altimeter source, and allows approach procedures to be built without the cost of installing ground stations at each airport. A new class of approach procedures, which provide vertical guidance requirements for precision approaches, has been developed to support satellite navigation use for aviation applications. These new procedures called Approach with Vertical Guidance (APV) include approaches such as the LNAV/ VNAV procedures presently being flown with barometric vertical navigation. Figure 9-32. 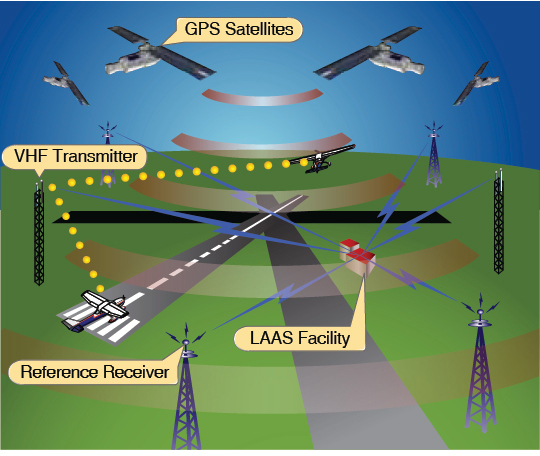 The LAAS system working with GPS satellites, reference receivers and radio transmitters which are located on or in the vicinity of the airport. Inertial Navigation System (INS) is a system that navigates precisely without any input from outside of the aircraft. It is fully self-contained. The INS is initialized by the pilot, who enters into the system the exact location of the aircraft on the ground before the flight. The INS is also programmed with WPs along the desired route of flight. INS is considered a stand-alone navigation system, especially when more than one independent unit is onboard. The airborne equipment consists of an accelerometer to measure acceleration—which, when integrated with time, gives velocity—and gyros to measure direction. Later versions of the INS, called inertial reference systems (IRS), utilize laser gyros and more powerful computers; therefore, the accelerometer mountings no longer need to be kept level and aligned with true north. The computer system can handle the added workload of dealing with the computations necessary to correct for gravitational and directional errors. Consequently, these newer systems are sometimes called strap down systems, as the accelerometers and gyros are strapped down to the airframe rather than being mounted on a structure that stays fixed with respect to the horizon and true north. The principal error associated with INS is degradation of position with time. INS computes position by starting with accurate position input which is changed continuously as accelerometers and gyros provide speed and direction inputs. Both accelerometers and gyros are subject to very small errors; as time passes, those errors probably accumulate. While the best INS/IRS display errors of 0.1 to 0.4 NM after flights across the North Atlantic of 4 to 6 hours, smaller and less expensive systems are being built that show errors of 1 to 2 NM per hour. This accuracy is more than sufficient for a navigation system that can be combined with and updated by GPS. The synergy of a navigation system consisting of an INS/IRS unit in combination with a GPS resolves the errors and weaknesses of both systems. GPS is accurate all the time it is working but may be subject to short and periodic outages. INS is made more accurate because it is continually updated and continues to function with good accuracy if the GPS has moments of lost signal.